Israel, home to three major world religions, is a destination on many travelers’ bucket lists — and for good reason. The country has lots to offer, from miles of sandy beaches and a nightlife scene in Tel Aviv that rivals New York City’s to countless UNESCO World Heritage sites and some of the best hummus money can buy. If you’re traveling from North America, there are a limited number of nonstop, daily flight frequencies — a total of 13 — as opposed to other destinations such as London. Paid, round-trip tickets run anywhere from $800 to upwards of $1,600, whereas business-class tickets can cost $4,000-$6,000 (though we have seen sales in the past). You have plenty of options for visiting Jerusalem and beyond using points and miles. Image courtesy of Shutterstock. The limited number of nonstop flights naturally means there’s a limited number of seats. Though there are more options available if you’re willing to connect through Europe, there are some ways to fly (in both coach and business) to the Holy Land without connecting. You can use AAdvantage miles to fly Royal Jordanian’s Dreamliner to Israel (though you’ll have to connect). Image courtesy of the airline. American Airlines no longer operates its PHL-TLV route, so you can’t redeem AAdvantage miles for nonstop flights to Israel. If you want to use AAdvantage miles to fly to Israel, you’ll need to connect. Options include British Airways through London-Heathrow International Airport (LHR), Finnair through Helsinki Airport (HEL), Air Berlin through Berlin Tegel International Airport (TXL), Iberia through Madrid-Barajas International Airport (MAD) and Royal Jordanian through Amman Queen Alia International Airport (AMM). Most of the year, award availability on British Airways from North America to Israel via LHR is plentiful, but in addition to the miles required, taxes and carrier surcharges on round-trip tickets will cost anywhere between $450 to $1,050 per person. Searching for Finnair flights on American Airlines’ website tends to turn up a lot of phantom award space, so you’re better off calling American to see if an agent can confirm and book award space. Air Berlin shows decent award availability over the next eleven months via TXL in coach, but I only found a few days with business-class availability. Round-trip awards in coach entail minimal fuel surcharges of about $85. Royal Jordanian provides another option for flying into Tel Aviv, with flights connecting in Amman. The carrier operates flights from Chicago (ORD), New York-JFK, Detroit (DTW) and Montreal (YUL). The flights are operated by Boeing 787 Dreamliners and feature lie-flat seating in business class on all routes. On all routes, award availability is pretty decent and will run you 140,000 and about $200 in taxes and fuel surcharges round-trip in business class. Great award availability on the Montreal-Amman Royal Jordanian flight. The only downside to this booking is that you’ll sometimes need to call American Airlines and piece together this specific award itinerary. If you want to book one of these redemptions and you’re short on AAdvantage miles, consider one of the following co-branded credit cards. 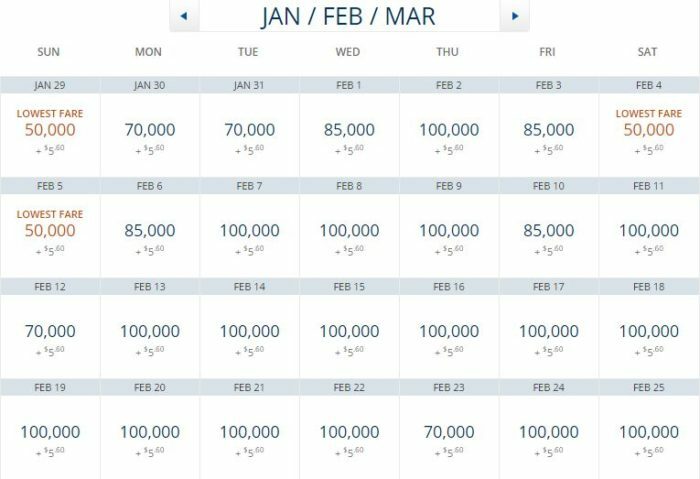 The Citi AAdvantage Platinum Select World Elite Mastercard is currently offering a bonus of 60,000 miles after you spend $3,000 in the first three months of account opening, and you’ll get 10% of your redeemed miles back (up to 10,000 per year). This card has a $99 annual fee that’s waived the first year, and no foreign transaction fees. There’s also the Citi AAdvantage Executive World Elite Mastercard, which is offering 50,000 miles after you spend $5,000 in the first three months. While this card has a $450 annual fee, it includes full Admirals Club lounge membership (for authorized users as well), and you can earn 10,000 EQMs toward elite status when you spend $40,000 on the card in a calendar year. Using Flying Blue miles to fly Air France or another SkyTeam carrier can be a great award option. Image courtesy of Shutterstock. Ever since Delta stopped publishing its award charts, there’s been a decrease in Saver-level award space for flights from the US to Israel. From now until 11 months out — when the Delta calendar is open — there are zero Saver coach or business-class seats. Non-Saver space can run anywhere from 50,000 to 105,000 SkyMiles in coach, and from 160,000 to 295,000 miles in business, one-way. Delta Saver award space does pop up here and there. 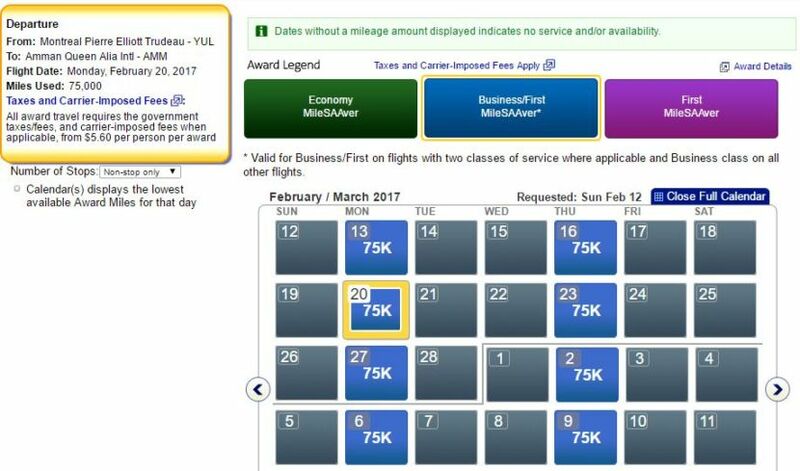 Even when you’re searching 11 months out, award redemption prices remain high, at 225,000 to 295,000 miles for business class on one-way travel in both directions. Here’s a look at business-class Delta awards. Delta’s business class, Delta One, offers an excellent option for flying in comfort from JFK to TLV, but with prohibitively high award redemption prices, you’re probably better off using your hard-earned miles on a different award. For SkyTeam flyers, the cheapest award redemption to Israel from North America is available through the Flying Blue program (now a transfer partner of Chase Ultimate Rewards). As discussed in Jason Steele’s post on Using Airline Geography to Find Award Chart Sweet Spots, Flying Blue classifies Israel as a part of Europe, bringing the typical award prices to a lower level. SkyTeam availability is most plentiful when you’re departing from JFK. SkyTeam partners Aeroflot, Alitalia, Air France and KLM all fly from JFK to TLV via their European hubs. Though there aren’t nonstop flights, Flying Blue offers tremendous award availability in business and coach. 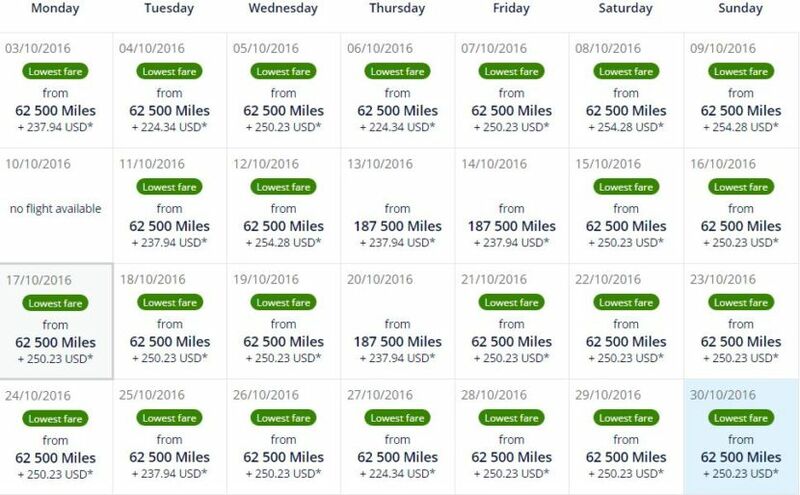 Availability is typically like this throughout the year in both coach and business class. Though fuel surcharges round-trip are around $500 in business and $240 in coach, compared to cash prices during peak seasons (such as October 2016, which is during the Jewish High Holiday season), you’re getting a very decent deal. Also keep in mind that every month, Flying Blue releases a new list of Promo Awards, which offer discounts on select redemptions. These often feature discounts of 25% to 50% in coach or business. 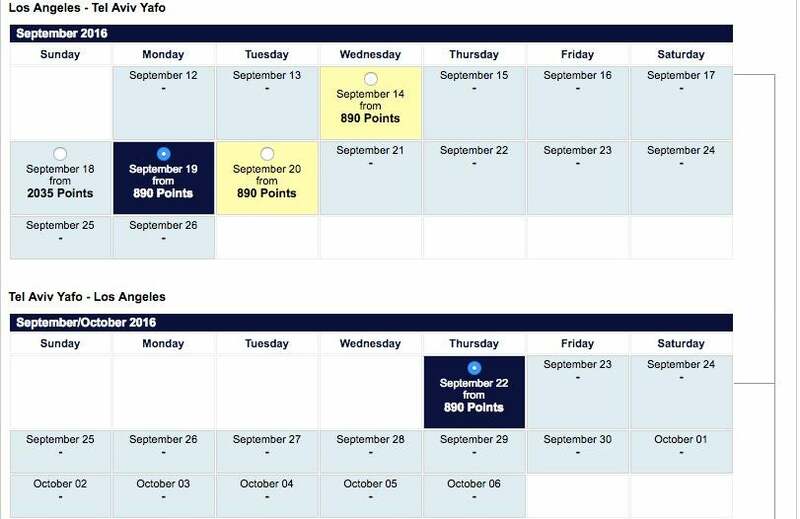 These can bring award redemptions from SkyTeam North American gateways down to a shockingly low 25,000/37,500 round-trip in coach or 62,500/93,750 in business. So if you’re set on flying SkyTeam, your cheapest award option is using FlyingBlue miles. If you want to book a flight through Flying Blue, you can go through American Express Membership Rewards, Chase Ultimate Rewards, Citi ThankYou Rewards or the Starwood Preferred Guest Program. Since all programs offer a 1:1 transfer rate, the best option depends on the credit cards currently in your wallet. If you’re just starting out with transferable points and want to earn a lot of them quickly, you might want to consider the Chase Sapphire Reserve Card, which is currently offering 100,000 Ultimate Rewards points after you spend $4,000 in the first three months. It earns 3x points on all travel and dining purchases, and while it has a $450 annual fee, it makes up for it with perks like a $300 annual travel credit. There’s also the Chase Sapphire Preferred Card, which is currently offering a sign-up bonus of 50,000 points after you spend $4,000 in the first three months. It has a $95 annual fee that’s waived the first year, and earns 2x points on dining and travel. You could also consider a Delta co-branded card, such as the Gold Delta SkyMiles Credit Card from American Express, which is currently offering 30,000 miles after you spend $1,000 in the first three months. This card has a $95 annual fee that’s waived the first year, and no foreign transaction fees. There’s also the Platinum Delta SkyMiles Credit Card from American Express, which is offering 35,000 miles and 5,000 MQMs toward elite status after you spend $1,000 in the first three months. This card has a $195 annual fee, and no foreign transaction fees. Fly Lufthansa first class to Israel (with a connection in Germany) for 140,000 United miles one-way. United operates two flights a day from its Newark hub to Tel Aviv, and the airline recently launched a daily flight from SFO to TLV on its Boeing 787 Dreamliner. 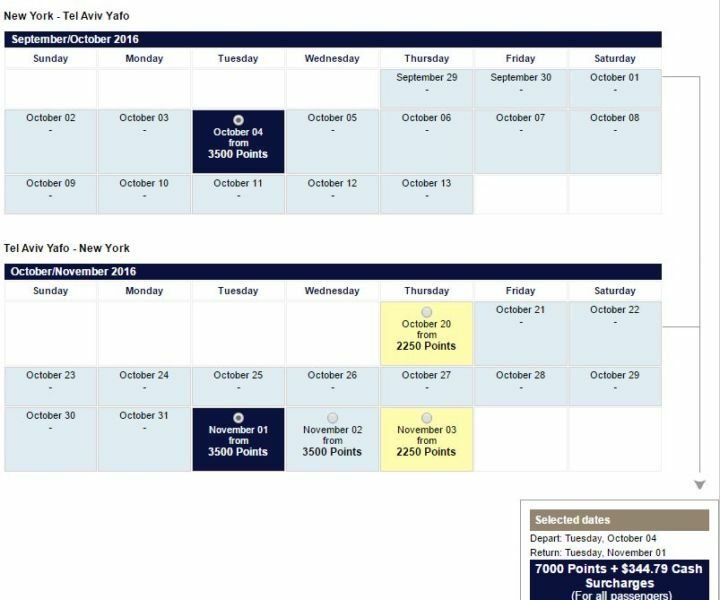 And on its SFO-TLV flight, United was opening up both coach and (very limited) business Saver award space in early October and much of November. Award availability close-in and a bit after on United’s SFO – TLV is looking great. Outside of close-in award space, there’s a lack of award space in either class of service until three months out. And even then, the award space is pretty unpredictable, with a few days here, and a few days there. November appears to have the most availability on both the SFO and EWR routes. If you can snag a nonstop award flight, your best bet is to transfer points to ANA’s Mileage Club or Singapore’s KrisFlyer program and redeem Mileage Club miles or KrisFlyer miles, since those programs charge lower rates than United. ANA Mileage Club partners with American Express Membership Rewards and Starwood Preferred Guest. Luckily, KrisFlyer partners with all four major transferable point programs, so you have plenty of options for rounding up enough miles to book an award. Using ANA Mileage Club miles is cheap way to go to Israel. The Star Alliance has the largest presence in Europe, providing lots of connecting opportunities in both coach and business — and for more than a single award seat. The most luxurious way to fly from North America to Israel when connecting in Europe is to fly Lufthansa first class via Frankfurt (FRA) or Munich (MUC). Lufthansa is pretty predictable when it comes to releasing last-minute first-class award space — and for 140,000 United Miles and about $110, it can be a terrific, and very luxurious, option. Note that you can only book Lufthansa first-class awards with United miles within 15 days of departure. Throughout the year, there’s consistently coach and business-class award space from North America to Tel Aviv. You’ll find the most award space on Turkish Airlines and sporadic award space on Swiss via Zurich (ZRH). Saver coach and business award space is available every day in January 2017. This isn’t just from New York City airports to Tel Aviv — this holds true from Tel Aviv to other Star Alliance hubs like Chicago (ORD) as well. The sheer amount of connection options to Tel Aviv via Europe — plus the fact that United does not pass on taxes and fuel surcharges to customers — makes United MileagePlus/Star Alliance redemptions very worthwhile options. 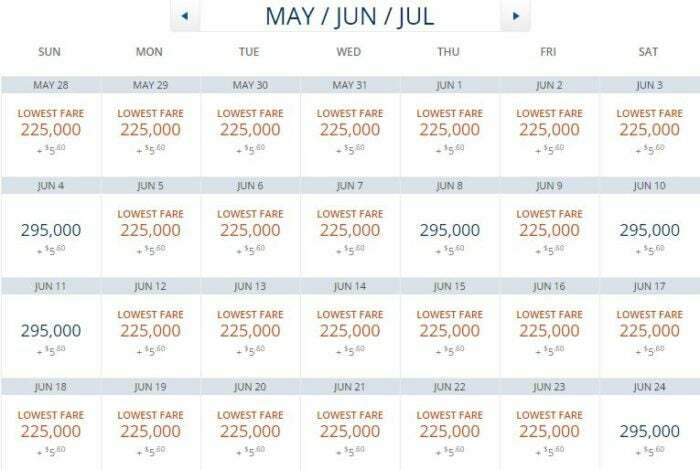 If you’re looking to book an award flight on United metal, your best bet is to go through Singapore’s KrisFlyer program to score lower redemption rates. As mentioned above, KrisFlyer partners with all the major transferable point programs and ANA partners with both Amex and SPG, so you have plenty of options for topping up your accounts. If you want to book a Lufthansa, Swiss or Turkish award, though, you’ll want to use United miles, which you can earn with the United MileagePlus Explorer Card. This card’s currently offering 40,000 miles when you spend $2,000 in the first three months, and it charges a $95 annual fee. You could also transfer Ultimate Rewards points to United at a 1:1 rate. 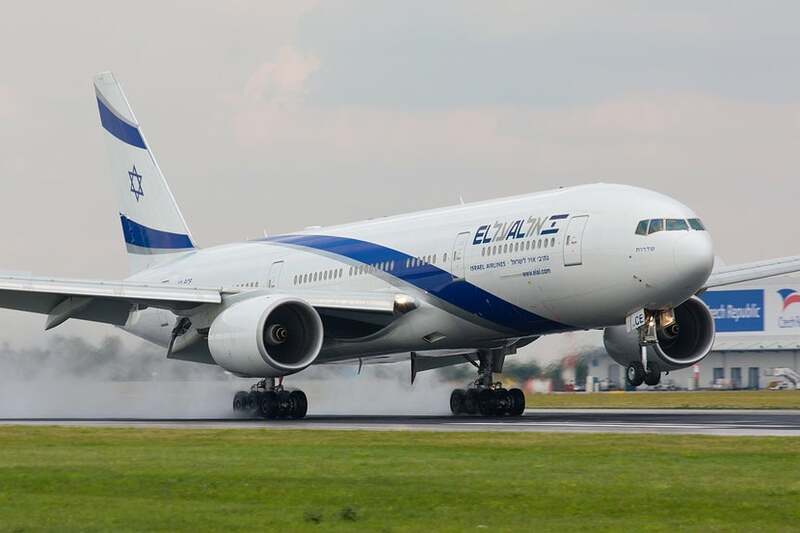 El Al is a solid non-alliance option for flights to Israel. Image courtesy of Shutterstock. El Al, the flag carrier of Israel, operates the most nonstop flights from North America to Israel. The downside to using Matmid (El Al’s frequent flyer program) is that there are limited rewards-earning opportunities. The only transferable point program that partners with Matmid is American Express Membership Rewards — and it offers a sub-par transfer rate of 1,000 Membership Rewards to 20 Matmid points. Matmid award redemptions are divided into two groups: (1) Executive, which you can become if you transfer 100 Matmid points (or 5,000 Membership Rewards) from a non-Israeli credit card (i.e., any Membership Rewards-earning card); and (2) regular. Those groups have seasonal rates, higher in the summer and lower in the winter in coach class only. You can find info on the cut-off dates for the seasons here. Business and first class remain the same year-round. While the value for business and first-class redemptions are less than appealing, coach redemptions in either season are on par with other award redemption options. The El Al website and award search section is pretty old and clunky, but don’t let that throw you off. Award availability tends to be quite good, even if award redemption prices are not the most competitive. El Al availability from LAX. Sparse availability during peak holiday season, but starts to open up in November. Also note that El Al does not operate flights during the Jewish Sabbath or holidays. 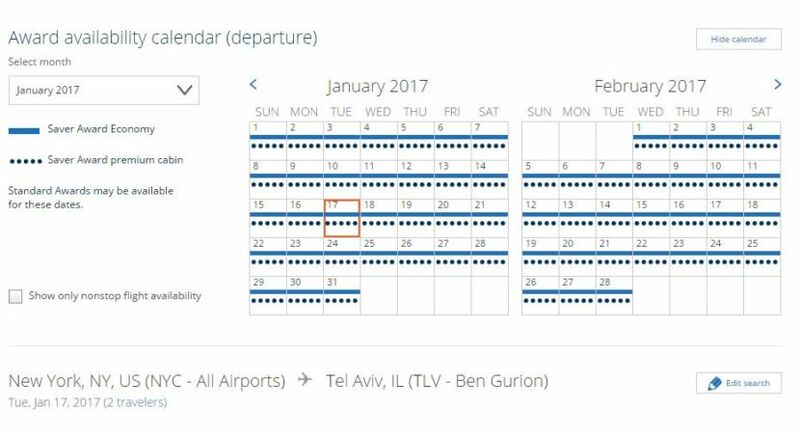 While availability is pretty good (with the exception of the High Holidays), El Al’s business class isn’t aspirational, so if you’re looking to transfer Membership Rewards to El Al’s Matmid program, you might want to stick to coach. 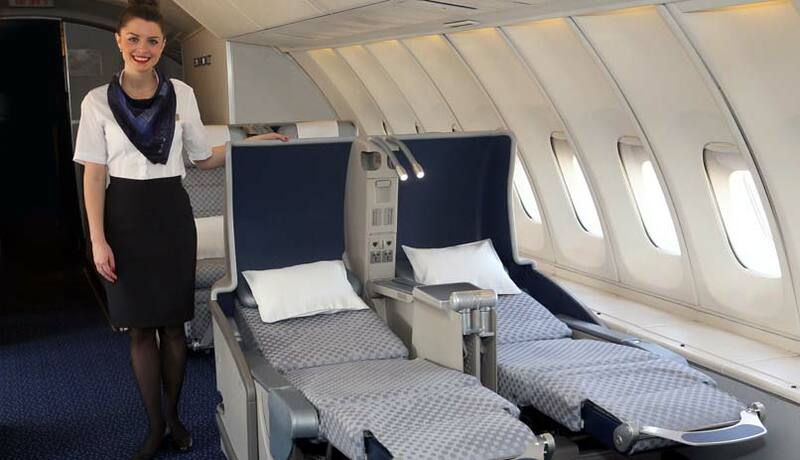 El Al’s business class isn’t the most luxurious premium cabin out there. Image courtesy of the airline. The easiest way to book an El Al award for US-based travelers will be to transfer Amex Membership Rewards points to the Matmid program, even though the transfer rate is just 50:1. You can earn these points with the American Express Premier Rewards Gold Card ($195 annual fee waived the first year; check the CardMatch tool to see your current offer) and The Platinum Card from American Express, which is currently offering 60,000 points after you spend $5,000 in the first three months. The latter card has a $550 annual fee but includes Centurion Lounge access along with several other premium perks. There are plenty of award options for reaching Israel from the US — especially if you don’t mind connecting in Europe or the Middle East. The best choice for you depends on your travel preferences and where you bank your points and miles, though luckily it’s easy to top off your frequent flyer account to book an award thanks to transferable point programs and credit card sign-up bonuses. What’s your favorite award flight option to Israel?